U.S. employers added 280,000 positions last month, including 262,000 new hires in the private sector. 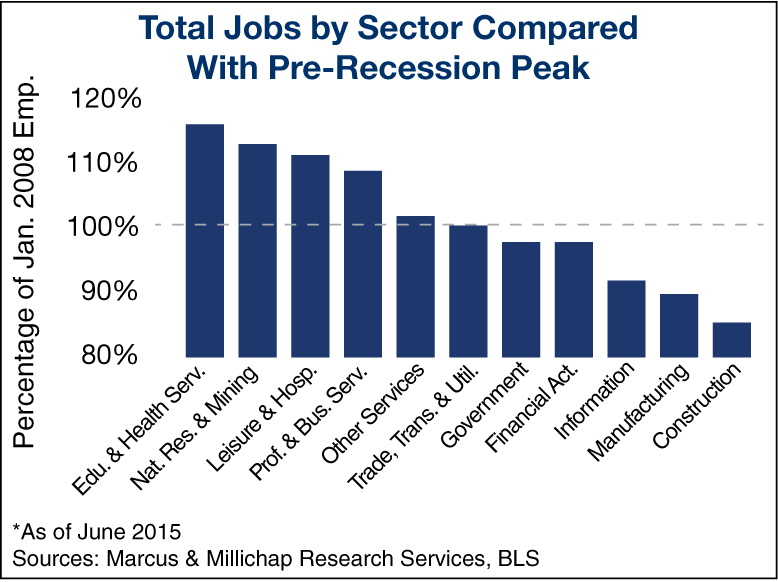 With these gains, total employment is 3.3 million jobs above the pre-recession peak. Not all employment sectors have contributed to the growth, however, as construction payrolls are still 1.1 million lower than their pre-downturn peak, but new residential and commercial projects have begun to pick up. Government and manufacturing jobs also face substantial deficits from prior levels, whereas education and health services expanded throughout the economic downturn, adding nearly 3.1 million positions. The shale oil boom lifted natural resources and mining staffing, but so far this year the sector has lost 68,000 jobs due to lower oil prices. This entry was written by marcusmillichap, posted on June 8, 2015 at 4:25 pm, filed under Uncategorized. Bookmark the permalink. Follow any comments here with the RSS feed for this post. Post a comment or leave a trackback: Trackback URL.